Nature's boost for fine hair, our style-prep infuses all-day weightless volume that feels naturally yours. Thickens strands with a botanical blend of passion fruit, rice bran, açaí oil, organic aloe and acacia gum. Boosts volume with a natural corn-derived polymer-helping give fine, limp strands the hold they need for body that lasts all day. Weightless conditioners detangle to help prevent breakage from combing. Helps refresh volume on non-shampoo days-without adding weight. This products was recommended to me by Aby, a very friendly beauty consultant in Debenhams in Henry Street, in Dublin and I am so happy she did. I've been using it for a month now, and I am in love with it! I have very fine hair and this is the first product I've found that not only creates volume that moves and doesn't feel sticky, but actually lasts the entire day. It really leaves my hair silky, shiny and soft to touch. I wash my hair, spray it in, blow dry it with a brush and I am ready to go, with salon results; It gives my hair body that lasts all day without the need for any other products. I don't use hairspray, since I absolutely cannot stand the way it makes my hair feel and with this product, no hair spray needed at all! You also could use it on dry hair to refresh your volume or just give a boost to hair that's been through a rough day, just be careful not to use too much as it might weigh your hair down. The bottom line is, I love how my hair looks with this product and would highly recommend it for anyone looking for some natural volume. 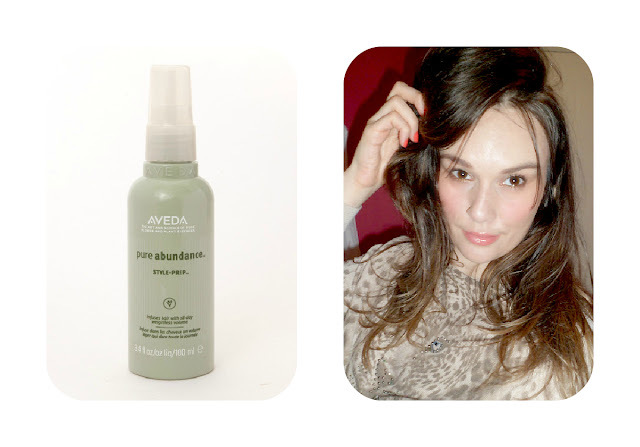 Have you tried the Aveda's Pure Abundance Style Prep yet? You have such great hair! I really love Aveda products, I've found they always work wonderfully well! I haven't tried it, but I think I'll have to find it! It sounds like a wonderful product! I have fine hair too, so I always have to try to battle with product making my hair look to overworked. Your hair looks lovely. Hi, Marina! Thanks for visiting my blog and for your comment. I love this lipstick we show in this post.